This SunLodge is slightly smaller than the Redwood and Aspen, but just as comfortable. The reason: two bedrooms, two bathrooms and two separate toilets. Suitable for 4 adults and a child. The living area is 38m², including the wooden patio with overhead sunshades. Slightly smaller than the SunLodge Redwood and Aspen, but just as comfortable: the luxurious SunLodge Maple! You can rent this accommodation for a relaxing camping holiday for 5 people (maximum 4 adults). In this SunLodge mobile home you have the convenience of two bathrooms and two separate toilets. The beds are large (with the exception of the child’s bed of course) and provided with extra deep mattresses for a wonderful night’s rest. This is a wonderful example of glamping (glamorous camping)! 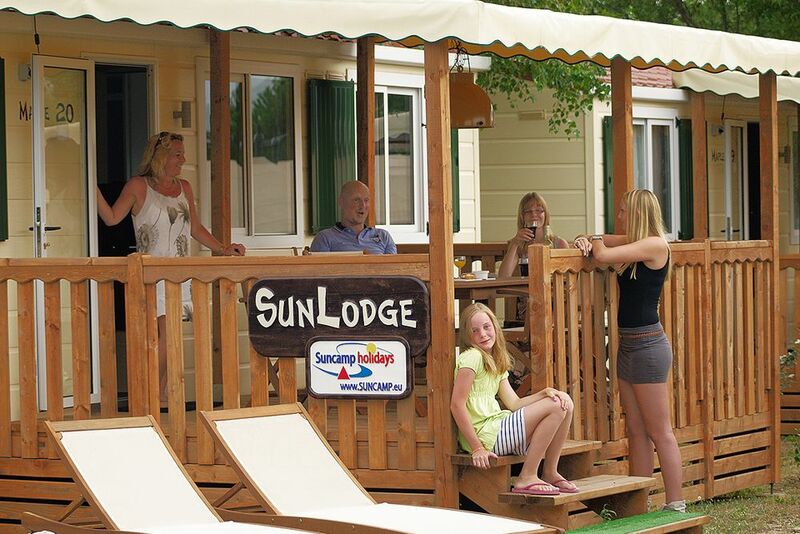 The SunLodge Maple can be booked at campsites in the South of France (on the Mediterranean), campsites in Italy (on Lake Garda and the Adriatic) and at one campsite in Austria. Make your selection and enjoy a wonderful holiday! ** Select a campsite and click by SunLodge Maple on ‘Other information’.